illus. by David Litchfield. 40p. Clarion. Mar. 2019. Tr $17.99. ISBN 9781328595898. 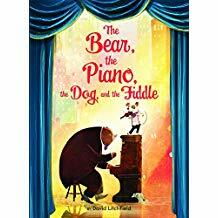 PreS-Gr 1—The bear from The Bear and The Piano returns in this charming sequel about friendship and perseverance. Hector (the human) and Hugo (the musically gifted dog) live in the shadow of the Bear's success and fame. Hector plays the fiddle on his street every day while his friend Hugo watches with admiration. One day, when a discouraged Hector gives up on his dream and packs his fiddle away, Hugo finds an opportunity to pursue his own passion for music. Eventually, Hugo is invited to join Bear's Big Band and Hector must decide if he can stomach his jealousy and be proud of his friend. Mixed-media illustrations portray a magical and musical city with bright lights and excited faces. The crowds are filled with a diverse collection of humans and full-page spreads of concert halls and vast rooftops immerse readers in a fantastic musical world. The prose depicts Hector's shifting emotions with precision and kindness as he overcomes his jealousy and realizes that more than anything he misses his old friend. The message of friendship and forgiveness will resonate with readers searching for a fantastic and musical story. VERDICT An excellent tale about supporting friends and being happy for them when they succeed.